Take a walk on the style side (pun very much intended) and look closer on your next stroll down Lonsdale Street. Behind the street windows and among the melting pot of restaurants and bars, a fashion feast awaits. Tucked away from the concrete and construction awaits a visually inspiring playground; divine interiors, inspired spaces, beautiful merchandise and bucket loads of style. The rise of Braddon as our inner-city business hub has connected us – bridging the gap between community and commerce. We now have stores and cafes full of friends or friends-of-friends, these strong social ties offer a kind of support system and encourages business growth and opportunity. Braddon has brought together a group of like-minded individuals in a very organic way – nothing feels out of touch or intimidating as might be expected in a booming, inner-city area. The Braddon buzz has infiltrated the wider community of Canberra, the secret is most definitely out but the details are often missed when we are racing to grab our caffeine fix or dodging the parking inspectors during lunch. So, on closer examination, what is on offer for the fashion lover or the style chaser? Look no further than Rebel Muse, Browlab and Designer Op Shop, where an array of styling inspiration awaits. With a carefully curated selection of vintage clothing and accessories, Designer Op Shop is a walk down memory lane with a fashion-forward edge. Behind this beautiful retail store is mother daughter duo Sharyn and Taylor, who offer a wide range of pre-loved clothing. If you enjoy trawling through op-shops but want high quality product and exceptional customer service, Designer Op Shop is a must visit. Immerse yourself in the romance and style of times-gone-by, here you will find yourself returning time and time again. Canberra’s premier designer boutique, Rebel Muse is more than just a retail space – the store fit-out is cutting edge, the team is like family and the pieces are carefully chosen to work together for maximum shop-ability and ease. 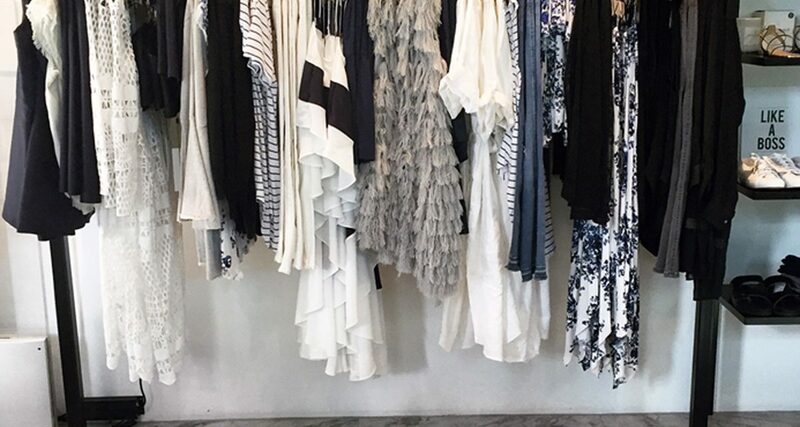 Alicia Xyrakis, owner and manager, has a great eye; every item in store works together in an effortless way, from quality basics through to cutting-edge styles and standout investment pieces available in store and online. This is one style destination to mark on your map. While not a “fashion” destination as such, one step inside Browlab and you feel as if you are in a hidden away New York warehouse where everybody who is anybody has an appointment. In simple terms: style bounces off the walls here. The interior is stunning, with a fresh, minimalist approach. On first entry you are greeted by a beautiful painting by Jessica Cochrane, the divine scent of a glasshouse candle and a light, airy vibe that takes you far away from the cold streets of Canberra. Sianne Fitzsimons and Tegan Daley created Browlab with an aim to provide a fresh and unique approach to beauty. Brow Lab is a place to be pampered, inspired and receive the highest quality service in beauty technology. Feeling stylish is more important than looking stylish, true style comes from within – it is a mind frame, a vibe, a confidence in oneself. A visit to any of these three places will guarantee that that stylish feeling sticks around long after you have walked out the doors.